These cheesy and crunchy tikkis are surely going to steal the hearts of your fussy kids. 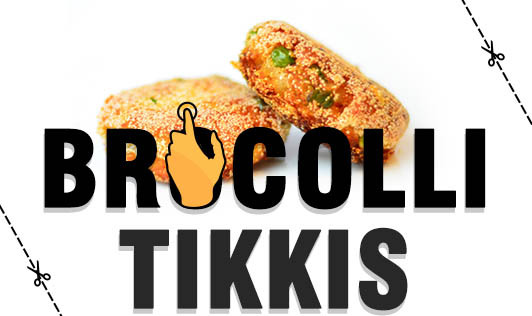 The paneer and cheese stuffing inside, gives these tikkis a yummy and healthy twist. • Heat 2 teaspoons of oil in a nonstick pan, add the chopped onion, and sauté on medium flame for 2 minutes until they turn translucent. • Add the garlic and green chilies, and sauté on medium flame for 5 minutes. • Once the broccoli mixture cools, add potatoes and corn flour, and mix well. • Divide the mixture into 6 equal portions. • Mix the paneer and cheese in a bowl and keep aside. • Shape the tikkis into small balls and flatten them. • Press a little in the center and stuff with the paneer and cheese mixture. Roll again to seal properly and flatten again. • Grease the nonstick pan with very little oil and cook the tikkis until they turn golden brown on both sides. • Serve hot with ketchup.